the location of Troy in 1869—two years before he began to excavate that site. He drew wide attention to his findings through the rapid publication of his work at Troy and related sites, as well as popular reports to newspapers such as The Times. His results have undergone considerable reinterpretation, initially by his co-worker Dörpfeld, who only three years after Schliemann’s death, redefined the occupation level at Troy that was considered to have belonged to the Homeric period. Although Schliemann’s excavations and research around the Aegean were initially motivated by the desire to elucidate a specific literary text, they brought the Greek Bronze Age and its antecedents to light for the first time. He conducted his work as a conscious problem-oriented exercise, rather than simply to recover attractive finds from a known historical site; he also paid attention to the whole stratigraphic sequence at Troy, not just a single period. His approach was in stark contrast to Mariette’s discovery of the Serapeum, at Memphis in Egypt, in 1851. Mariette knew about the site from an ancient Greek traveller’s account and from references in Egyptian papyri, but only discovered it thanks to a good memory and the chance observation of the head of a sphinx sticking out of the sand; four years of excavation followed (Daniel, 1967, 229). Happy accidents of this kind were the rule rather than the exception. Many sites mentioned in historica sources or the Bible were only identified because their names appeared on building inscriptions or clay tablets found during plunder for museum exhibits. One example of this kind was the site of Sippar in southern Mesopotamia (the biblica Sepharvaim) where Rassam excavated by British Museum in 1881 . Ironically, one of the cuneiform inscriptions that he found recorded an excavation carried out by the Babylonian king Nabonidus in the sixth century BC. Nabonidus dug beneath the foundations of a temple dedicated to the Sun-God Shamash to find out who had built it, and discovered an inscription through which he can get the answer of his question (Lloyd 1980, 156). Schliemann has interest in Archaeology since his childhood. Schliemann claimed that his father had already introduced him to tales of the Greek Classical Era as related in The Iliad and The Odyssey, and had given him an Illustrated History of the World as a Christmas gift in 1829. Heinrich Schliemann even claimed in later life that by the age of eight he had already formed the ambition to excavate the ancient city of Troy. Schliemann also related how he and a young playmate, a girl named Minna Meincke, used to conduct “archaeological excavations” at the local churchyard and would spend time in the ruins of a local castle. It happened that Schliemann senior was accused of embezzeling church funds and the ensuing scandal and loss of income contributed to his sons presence in the Gymnasium being only a brief one. Despite having a real interest in the Greek language, and a scholarly cast of mind, Heinrich spend a few years in a trades and commerce related ‘vocational school’ before becoming a apprenticed to a grocer at the age of fourteen. Heinrich stayed in this employment for some five years but continued to read in line with his interests in his limited spare time. He later claimed to have taught himself Dutch, English, French, Spanish, Italian, and Portuguese, over some two years. In 1841 Heinrich abruptly left his employer and embarked as a cabin boy on a ship bound for South America but a shipwreck saw him being returned to German territory after a rescue and landing in the Netherlands. He subsequently gained employment in merchant trading enterprises and was sent by one such firm to the Russian city of St Petersburg where his talent for and interest in languages allowed him to learn Russian and Greek in order readily converse with his clients and other business contacts. Schliemann seems to have employed a system that he used his entire life to learn languages – that of writing up his diary in the language of whatever country he happened to be in. Circa 1851 Heinrich moved to California where one of his brothers had made a fortune during these years which were years of “Gold Rush.” Heinrich started a banking enterprise that bought and sold the gold dust won by the miners. Although he seems to have made a lot of money, (his bank seems to have handled $1,350,000 worth of gold in just six months), Heinrich Schliemann returned to Russia in 1852. Back in Russia Heinrich set himself up on somewhat gentlemanly patterns of life and married Ekaterina Lyschin, a niece of one of his wealthy friends. The new Mrs. Heinrich Schliemann seems to have expected Heinrich, although already quite wealthy, to continue to be prosperously active in business. Involvements in commerce as a contractor of military supplies at the time of the Crimean War (1854-1856) brought yet more wealth to the Schliemann household. This level of wealth allowed Heinrich Schliemann to retire from being an active merchant and to actively pursue his deep interest in the world of the ancient civilisations of Greece and Troy. He based himself in Paris and unsuccessfully tried to encourage his wife to bring their three children to continue their lives there. In 1868, after several years of archaeological exploration principally undertaken in Turkey, Heinrich Schliemann took on a partnership interest in a site at Hissarlik, previously investigated by a British Archaeolgist named Frank Calvert, that Schliemann himself was convinced was the site of the ancient city of Troy. Schliemann by this time seems to have become firmly committed to finding the site of Troy and to decisively proving the actual historicity of the “Trojan War” as related in the ancient greek classics. It happened that there was a falling out between Heinrich Schliemann and Frank Calvert as Schliemann, then an enthusiastic but perhaps unscientific excavator, assuming that “Homeric” Troy must be at the lower levels of the remains of the settlement appeasrs to have dug straight down to those levels without, in Calvert’s view, sufficiently investigating the materials removed. (Two children were born to this second marriage. These two, male, children were given the names Andromache and Agamemnon Schliemann). 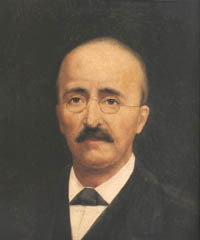 In the event the Turkish government disapproved of Heinrich Schliemann’s approach to publicizing his discoveries and revoked permissions to excavate at Hissarlik. Schliemann and Calvert further alienated the Turkish authorities by smuggling the so called “Priam’s Treasure” out of Turkey. Scliemann subsequently embarked on excavations on the island of Crete where, in 1876, he enearthed elaborate golden artefacts, including a so styled “Mask of Agamemnon” discovered alongside skeletal remains in shaft graves associated by Schliemann with the ancient civilisation of the Myceneans. The Turkish authorities had agreed to allow Schliemann to resume excavations at Hissarlik / Troy in 1876 but Schliemann did not return there to dig until a “second excavation” of 1878-1879. Other excavations followed in 1882-1883 and 1888-1890. During these later periods Heinrich Schilemann was assisted by other archaeologists including Wilhelm Dörpfeld, (in 1888-1890), who taught him to stratigrapize. Heinrich Schliemann developed a serious infection in his ears and after an operation in Greece in November 1890. Against the advice of his doctors he subsequently traveled to Leipzig, Berlin and Paris but medical complications associated with his initial ear complaint set in. He was on his way back to Athens for Christmas of that year but came to rest in Naples too unwell to complete the journey. He did visit the ruins of Pompeii but collapsed on Christmas day and died the following day. His friends ensured that he was buried in Greece in an elaborate mausoleum that Schliemann had already had built upon an Athenian hill and in the ancient Greek style as his final resting place. An inscription in ancient Greek above the entrance to this mausoleum declared it to be “For the hero, Schliemann.” Heinrich Schliemann remains a controversial figure often accused of manipulating the details of his own life and his “discoveries” to build a misleading picture of his career and achievements. Other sources, including early personal letters, do not seem to support his claims that he had a very serious interest from an early age in Archaeology. More seriously still a servant of long standing claimed that metal “artifacts” were manufactured at Schliemann’s request such they they could be “salted” for “discovery” at ancient sites. Even the Mask of Agamemnon itself is sometimes alleged to be in this category as it seems to be in a style not known elsewhere in Greek Archaeology. Casson S 1939, The Discovery of Man, London, Hamish Hamilton..
Daniel G 1967, The Origins and Growth of Archaeology,Harmondsworth, Penguin. Modern Archaeology ,Third Edition . Trigger B G 1980, Gordon Childe:Revolutions in archaeology,London, Thames and Hudson. Bodhisattva of Infinite Compassion or "" Avalokiteshvara ""
activity of compassion in the world and the willingness to bear the pain of others. Avalokiteshvara is the earthly manifestation of Amitabha Buddha, who represents mercy and wisdom. The bodhisattva is said to appear anywhere to help all beings in danger and distress.The Sanskrit name “Avalokiteshvara” is interpreted many ways — “The One Who Hears the Cries of the World”; “The Lord Who Looks Down”; “The Lord Who Looks in Every Direction. “The bodhisattva goes by many other names. In Indochina and Thailand he is Lokesvara, “The Lord of the World.” In Tibet he is Chenrezig, also spelled Spyan-ras gzigs, “With a Pitying Look.” In China the bodhisattva takes a female form and is called Guanyin (also spelled Quanyin, Kwan Yin, Kuanyin or Kwun Yum), “Hearing the Sounds of the World.” In Japan, Guanyin is Kannon or Kanzeon; in Korea, Gwan-eum; in Vietnam, Quan Am. One can find many more variations of those names.Most scholars say that until the time of the early Sung Dynasty (960-1126) the bodhisattva was portrayed in art as male. From the 12th century on, however, in much of Asia Avalokiteshvara took the form of a mother-goddess of mercy. Exactly how this happened is not clear. Here’s an utterly unsupported and probably off-the-wall speculation: The rise of the veneration of mother goddess Guanyin happened at the same time — 12th and 13th centuries — that the cult of the Virgin Mary was gaining popularity in Europe. Was there some cultural cross-pollination the historians don’t know about? Or some other factor that made mother goddesses particularly appealing during that time? Sometimes the bodhisattva is pictured with features of both genders. This is symbolic of the bodhisattva’s transcendence of dualities, such as male-female gender distinctions. Further, the Lotus Sutra says that the bodhisattva can manifest in whatever form is best suited for the situation. There are more than 30 iconographic representations of Avalokiteshvara in Buddhist art. These are distinguished by the number of heads and arms the bodhisattva displays, the bodhisattva’s body position, and by what is carried in the bodhisattva’s hands. There is often a small figure of Amitabha gracing the bodhisattva’s head. He may hold a lotus, mala beads, or a vase of nectar. He may be standing, in meditation, or seated in a “royal ease” pose. The bodhisattva often has multiple heads and arms, which symbolize his limitless capacity to perceive suffering and to help all beings. According to legend, when Avalokiteshvara first heard the suffering of the world his head burst from pain. Amitabha, his teacher, took the pieces of his head and remade eleven heads in its place. Then Amitabha gave Avalokiteshvara a thousand arms with which to ease all suffering.You may look for the bodhisattva in the form of a white-robed woman, or an angel, or an unseen spirit. However, Zen teacher John Daido Loori said, “Avalokiteshvara Bodhisattva is the Hearer of the Cries of the World. And one of the characteristics of Avalokiteshvara is that she manifests herself in accord with the circumstances. So she always presents herself in a form that’s appropriate to what’s going on. In the Bowery, she manifests as a bum. Tonight, in barrooms across the country, she’ll manifest as a drunk.? “Every time there’s a stranded vehicle on the side of the road and a motorist stops to help Avalokiteshvara Bodhisattva has manifested herself. Those characteristics of wisdom and compassion are the characteristics of all beings. We all have that potential. It’s just a matter of awakening it. You awaken it by realizing there’s no separation between self and other.” Do not think of the bodhisattva as a being separate from yourself. When we see and hear the suffering of others and respond to that suffering, we are the heads and arms of the bodhisattva. According to Internet and Books…..
Korean painting of Avalokiteśvara. Kagami Jinjya Temple, 1310 CE. Japanese painting of Avalokiteśvara meditating. 16th century CE. Vietnamese statue of Avalokiteśvara with 1000 hands. 17th century CE. Mongolian statue of Avalokiteśvara. Tallest indoor statue in the world. In a marvelously unified and dynamic composition expressing the rhythm and harmony of life, Nataraj is shown with four hands represent the cardinal directions. He is dancing, with his left foot elegantly raised and the right foot on a prostrate figure — ‘Apasmara Purusha’, the personification of illusion and ignorance over whom Shiva triumphs. The upper left hand holds a flame, the lower left hand points down to the dwarf, who is shown holding a cobra. The upper right hand holds an hourglass drum or ‘dumroo’ that stands for the male-female vital principle, the lower shows the gesture of assertion: “Be without fear.” Snakes that stand for egotism, are seen uncoiling from his arms, legs, and hair, which is braided and bejeweled. His matted locks are whirling as he dances within an arch of flames representing the endless cycle of birth and death. On his head is a skull, which symbolizes his conquest over death. Goddess Ganga, the epitome of the holy river Ganges, also sits on his hairdo. His third eye is symbolic of his omniscience, insight, and enlightenment. The whole idol rests on a lotus pedestal, the symbol of the creative forces of the universe. This cosmic dance of Shiva is called ‘Anandatandava,’ meaning the Dance of Bliss, and symbolizes the cosmic cycles of creation and destruction, as well as the daily rhythm of birth and death. The dance is a pictorial allegory of the five principle manifestations of eternal energy — creation, destruction, preservation, salvation, and illusion. According to Coomerswamy, the dance of Shiva also represents his five activities: ‘Shrishti’ (creation, evolution); ‘Sthiti’ (preservation, support); ‘Samhara’ (destruction, evolution); ‘Tirobhava’ (illusion); and ‘Anugraha’ (release, emancipation, grace).The overall temper of the image is paradoxical, uniting the inner tranquility, and outside activity of Shiva. What is the First University ever established on this earth ??????????? there is no strong Archaeological evidence on behalf of this to prove. But Taxila or Takshashila at Pakistan hold this strongly to proof. However Takshashila or the well known Taxila was in real sense an international seat of learning where students from as far as Babylonia (Iraq), Greece, Syria, Arabia and China came to study. Takshashila could accommodate 10,500 students and during its time this university was the Harvard and MIT of the world. The University taught subjects using the best of practical knowledge acquired by the teachers.Takshashila offered as many as 64 different specialized courses like Vedas, grammar, philosophy, ayurveda, agriculture, surgery, politics, archery, accounts, warfare, astronomy, commerce, futurology, occult, music, dance, etc. There were even curious subjects like the art of treasure hunting, decrypting encrypted messages, etc. The students would opt for electives and then would do indepth study and research into their field of choice. Admission seekers into this great seat of learning first had to complete their basic education in their local institutions and reach the age of 16 before they were eligible for admission. Admission was highly competitive and based purely on merit. Even the sons of Kings would have to prove their merit before they were considered for admission. The course of study at Takshashila extended to as many as seven years. The students were always spoken of as going to Takshasila to ‘complete’ their education and not begin it. Every single student who graduated from this university would become a well sought after scholar all across the Indian subcontinent. There are not much of evidence to suggest that Takshashila had any female students in its campus. The students were usually admitted to instruction in Takshashila by their teachers on payment of advance of their entire tuition fees, which would normally include lodging and food. In lieu of paying the fees in cash, a student was allowed to pay them in the shape of services to his teachers. To this class apparently belonged the majority of the students who attended on their teachers by day and received instruction at night. They gathered firewood for their teachers or cleaned their houses and did the cooking. Some were allowed to pay after the completion of their study. Some would even have to beg to pay their cost of education at Takshashila. Payment would normally be in gold. Some scholars date Takshashila’s existence back to the 6th century BCE. It became a noted centre of learning at least several centuries before Christ, and continued to attract students from around the old world until the destruction of the city in the 5th century CE. Takshashila is perhaps best known because of its association with Chanakya. The famous treatise Arthashastra (Sanskrit for The knowledge of Economics) by Chanakya, is said to have been composed in Takshashila itself. Besides Chanakya other great scholars of their time like Panini (language and grammar), Jivak (medicine and surgery) and Charaka (Ayurvedic healer), the Maurya Emperor Chandragupta are also taught at Takshashila.The city of Takshashila is mentioned by the Chinese monk Faxian (also called Fa-Hien), who visited ancient sites of Buddhism in India. He came to Takshashila in 405 CE. In his book “A Record of Buddhistic Kingdoms. Being an Account by the Chinese Monk Fa-Hien of his Travels in India and Ceylon in search of the Buddhist Books of Discipline” he mentions the kingdom of Takshasila (or Chu-cha-shi-lo) meaning “the severed Head” (Chapter 11). He says that this name was derived from an event in the life of Buddha because this is the place “where he gave his head to a man”. Xuanzang (also called Hieun Tsang), another Chinese monk, visited Takshashila in 630 CE. He mentions the city as Ta-Cha-Shi-Lo. The city appears to have already been ruins by his time.There is some disagreement about whether Takshashila can be considered a university. While some consider Takshasila to be an early university or centre of higher education, others do not consider it a university in the modern sense, in contrast to the later Nalanda University. Takshashila is described in some detail in later Jataka tales, written in Sri Lanka around the 5th century.Takshashila was destroyed by the invading Huns who came from across Hindukush into Punjab in the fifth century, and never recovered. The British archaeologist Sir John Marshall conducted excavations over a period of twenty years in Takshasila.In 1980 Takshashila was declared a UNESCO World Heritage Site with multiple locations. Recently it has been ranked as the top Tourist Destination in Pakistan by The Guardian. The world’s first University was established in Takshila or Taxila or Takshashila (now in Pakistan) in 700BC. This centre of learning was situated about 50 km west of Rawalpindi in Pakistan. It was an important Vedic/Hindu and Buddhist center of learning. It was not a well organized university like Nalanda. Takshila was specialized in the study of medicine.Panini, the famous Sanskrit grammarian, Kautilya (Chanakya) and Charaka, the famous physician of ancient India, and Chandragupta Maurya were the products of this university. It gained its importance again during the reign of Kanishka. It was probably, the earliest of the ancient seats of higher education. Takshashila is perhaps best known because of its association with Chanakya. The famous treatise Arthashastra (Sanskrit for The knowledge of Economics) by Chanakya, is said to have been composed in Takshashila itself. According to Internet and Books .. Glimpse at the fantastic Architectural Monuments of Bagerhat,Bangladesh "" The Sait Gambuz Mosque""
Ancient Khalifatabad or well known place Decleared as World Heritage Site by UNESCO Sait Gambuz Mosque is a part of our past glorious days . As we the Bangladeshies can speak Bravely we are independent as we are strong enough to protect all oppressors. During Sultani period of Bengal Rule this Famous mosque was Built by Saint Ulugh Khan Zahan Ali. According to Medival History of Bengal he is the founder of Ancient city of Khalifatabad known as now a days Bagerhat . We get a lot of Archaeological evidence regarding it’s past history represents those golden age of Bengal. As the ruins of Architectural Monument or Archaeological remains lost city of Bagerhat now mainly consists of a number of mosques and the tomb of its founder, Khan Jahan Ali as well as his followers . This fantastic Architecture consists of 77 Domes but well known as 60 domed or tower mosque .If you go inside this mosque most of the ancient remains destroyed by recent construction or the destruction by the name of restoration as 60 pillars, now mostly covered in cement, hold the roof of this largest mosque of its time. In Fridays, the museum is closed and the mosques are reserved for praying. There are a lot of Bangladeshi daytrippers around. Most of them are gathered near the large pond behind the Khan Jahan tomb. They are staring at feeding a crocodile that lives in this pond Kalapahar(কালাপাহাড়).and Dhalapahar(ধলাপাহাড়) by name. This not only a site for archaeological interest and an important part of Bengal History but also a plese for religious sect. On the other side of the road is another small mosque, built in the traditional brick style. A few kilometers down the road is the shrine of Khan Jahan. This still is an active site of worship. It attracts both visitors and beggars. The prehistoric archaeology is one of the most important disciplines to learn about evolution of human society. It provides primary evidence of when and how people began to create and reproduce households, to develop successful strategies for healthy life and to create the wonderful human culture as a synthesis of beauty, interactions with nature and human creativity. One of the basic categories of prehistoric archaeology is archaeological culture. This is a regional term since the archaeological culture encompasses similar and identical material culture over a specific region during a specific period. The sites can be compact (the typical case) or spread over vast region (e.g. Pit Grave Culture). Archaeological culture requires a diachronic connectivity and presumes territorial connectivity although there are exceptions. As a rule, inner migrations result in a change of the material culture style, so one and the same population can be a barrier of different cultures. It is also presumed in prehistory that identical or very similar culture means a population with one and the same social identity that can be also named ethnicity. Defining an archaeological culture is a primary and extremely huge responsibility of the professional archaeologists. From global perspectives it is accepted that the local archaeologists have competence and enough academic education for correct recognition of the different archaeological cultures. Although usually based on replication and updates, defining new archaeological culture nowadays means in some cases a new scientific knowledge. However, some “new” cultures unfortunately create theoretical and ethical problems in the contemporary prehistoric archaeology. One of the lines of scholarly misconducts in prehistoric archaeology is rediscovering or renaming of well-known archaeological cultures. Typical instance is the case with Galatin in historiography: a well known culture (Salcuta IV or Salcuta IV – Telish IV, or Salcuta – Telish) was renamed Galatin by P. Georgieva in her contradicting PhD thesis in later 20th century (see the cited literature by P. Georgieva in Nikolova 1999). There was no single argument for such renaming. Salcuta IV was first discovered in Oltenia and most data still come from Romania. In Bulgaria the only site with rich settlement and pottery information was Telish, while Galatin provided handful well known from the other sites shards without any stratigraphic context. During the battle of culture naming there was even a rumor that Georgieva imported Sheibenhenkel shards from Telish to make “her culture” more impressive. Curiously, it is a fact that the initial excavations of Galatin conducted by B. Nikolov and H. Todorova did not report Scheibenhenkel shards. On top of everything, as a student P. Georgieva tried to mislead the director of a summer excavation that there was an artifact discovered in a grave of Pit Grave Culture. It was put by her under the head of the buried although with inventory number. Such joke was out of understanding of all other students who accepted the excavations as a scientific laboratory and not a place of game-like practicing of fraud. Salcuta IV (or Salcuta – Telish) is organically connected with Central Europe, so Northwest Bulgaria is just a periphery of this culture, which is of primary importance for understanding the Final Copper Age period in the Balkans (among the new literature online about Salcuta and Bodrogkeresztur see Luca, Roman & Diaconescu (online), Patroi (online), Thomas (2007-2009)). Curiously, instead following the scientific line of Balkan prehistoric research, new authors, without proved long-term and in depth knowledge on the region, replicated non-scholarly line of research. Recently, I. Merkyte included Galatin in a complicated chronological table, without any explanation why was chose Galatin. Such accumulation of mistakes creates layers of difficulties to understand Balkan prehistoric archaeology, which is important for so many crossing prehistoric and other humanitarian disciplines. Luckily, after the popular rediscoveries of cultures in Northeast Bulgaria by H. Todorova in later 20th century who had used the Romanian scientific contributions for building cultures and schemes named as “new for science”, Galatin is a rare instance of theoretical misconduct on Balkan prehistory in which usually work serious and respectful archaeologists. The chronological scheme of I. Merkyte in her 2005 publication also poses other essential questions: How can the replication of mistakes create a long diachronic line of misunderstanding of Balkan prehistory? For instance, it is stated that Sitagroi IV is synchronous with “Galatin” while there are serious in depth researches that clearly show that Sitagroi IV is a typical Early Bronze Age multilevel village founded over the prehistoric mound that followed Salcuta IV – Telish IV. In addition, there is a series of extensive researches that clearly shows that in light of present evidence Early Bronze Age began abt 3600 and there is no Transition period – a term introduced by S. Morintz and P. Roman in considerably early stage of modern understanding of Balkan prehistory. In late 1960s were missing so many rich excavations from different parts of this region that later showed not only continuity in the development of the cultural process but also the mechanism of the cultural and social transformations in later Balkan prehistory. Salcuta IV – Telish IV (or just Salcuta – Telish) is a stage of the Final Copper transformation of the Balkans that included intensive interactions with Central Europe and graduate increasing of this line of contacts together with steppe contacts and possible multidirectional ethnical migrations. The main fault of the Bulgarian variant of Transition period adopted by H. Todorova is that it ignored the Central European line of interactions and described the changes of the material culture as one direction invasion from the Russian steppe. This hybrid thesis that combined the Romanian term Transition period with the popular Gumbutas’ invasion theory has one of the biggest negative impacts on Balkan prehistory in later 20th century which extension is also the renaming of well-known and well-researched culture Salcuta IV (or Salcuta – Telish). According to online information, Gimbutas – Bulgarian model was replicated in a dissertation by I. Merkyte and also posed a very serious academic question: If a new archaeological material (like Liga and Ezero-Kale) is not a base for a new scientific conclusions by the author, should this material be defended as a PhD dissertation? What is in fact the scientific meaning of the PhD dissertation in archaeology – new theoretical knowledge or applied replicated knowledge? It is really pity in case with Liga, since the publication of the site (Merkyte 2005) shows a very rich material that could be a base for new brilliant scientific theses if it is analyzed in depth. As a matter of fact, as the identical dissertation by P. Georgieva showed in Bulgaria, it is impossible to resolve the problems of transition from late Copper Age to the Final Copper Age and from the Final Copper Age to Early Bronze Age base on limited regional case studies. Only broad regional comparative analyses provide relevant scholarly conclusions (see Nikolova 1999). The prehistoric chronological scheme is a primary research tool for expression of scholarly knowledge. However, from archaeological perspectives, they need to be well-argued in the text since seeing mixed chronologically cultures or unreasonable renaming create the impression of absence of deep and professional knowledge.